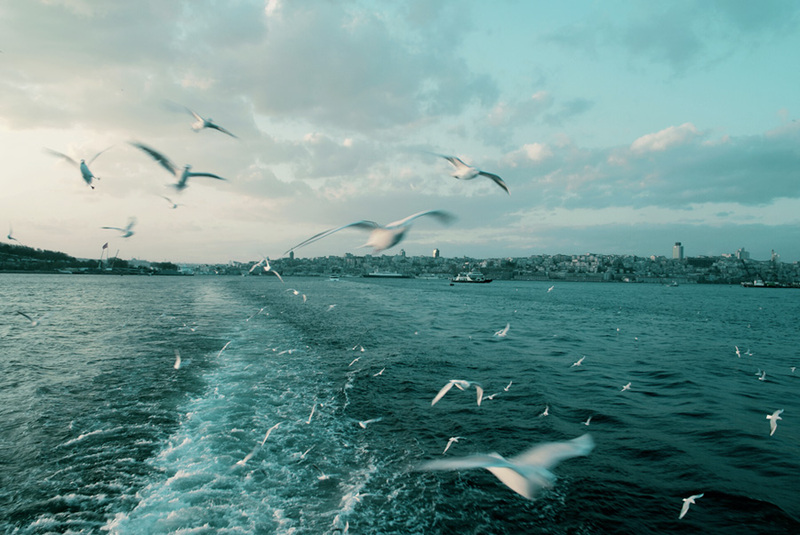 There is a whole culture attached to going out to eat fish in Turkey. Especially in Istanbul where it is renown for its excellent varieties from the Marmara Sea, having Balik (fish) and Raki (aniseed flavored spirit) at a restaurant by the Bosphorus( the strait that connects the Black Sea to the Marmara Sea) is one of those zesty moments, I cherish and try to repeat as often as I can. Those who are not fans of seafood should not despair because there is such a wide variety of meze (small tapas-like portions of salads and foods both hot and cold, eaten with alcoholic beverages, before the meal) that even a vegetarian can have a feast at one of these restaurants. The ritual starts with the inspection of the meze tray, which, depending on the restaurant can contain upto 15- 20 different alternatives. First the diners order their cold mezes from the tray and then go onto order the hot mezes The cold meze will include some vegetable dishes prepared with olive oil, vegetable dishes that are served with garlic yogurt, stuffed grape leaves or mussels, a variety of seafood like octopus or shrimp prepared with olive oil, garlic and lemon... the list can go on and on... the hot meze can be anything from borek (stuffed phyllo dough pastry) to shrimp stewed in a crock pot, to fried calamari or mussels... There are so many dishes that come out one after another that if you don't plan ahead, you won't have room left for the main meal. The reason so many different variety of meze is offered is because of the accompanying drink - Raki- and the ceremony of drinking what is commonly referred to as 'lion's milk' (it turns white when mixed with water) There is even a concept of Raki sofrasi (raki table) in Turkey which means several meze including feta cheese and melons, that is setup to be enjoyed with the raki, throughout a long period of time. Of course the conversations that accompany this ritual are priceless, some people drink it just for the conversation. The fish that one finds in Turkey already have distinctive flavors so they are usually prepared by grilling or frying them and served without any sauces. The only exception to this is the steamed sea bass that is stewed with butter, peppers, tomatoes, onions and mushrooms, but even in this dish there is no sauce that covers the fish. 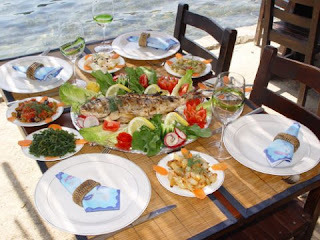 If you have the luxury of time, I recommend what the locals do - that is to either have a table laden with meze or pick one or two and order a wonderful fish and salad. Salad is another star on the tables of fish restaurants, usually prepared using different kind of salad greens.